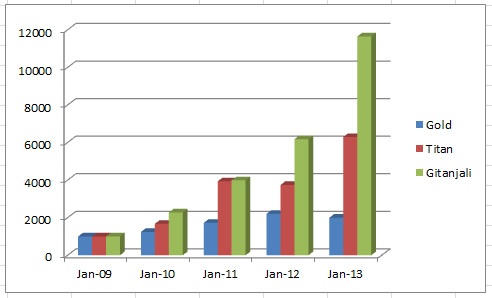 During last decade gold price in India took a great stride and suddenly came on radar of all investors. Gold has been darling for Indian investors for a long time and this event further confirmed their belief in gold investment. At Bazaar Analysis (Now, Safe Analytics) our team collected historical data of gold in India and across globe and came across some insightful information. Further, to compare it with stock market we chose two leading stocks in Indian market related to jewellery business. Titan has appreciation of 530% while Gitanjali rose by 1064% during the same phase. In order to make it easy to visualize for our readers we have made following comparison bar chart. 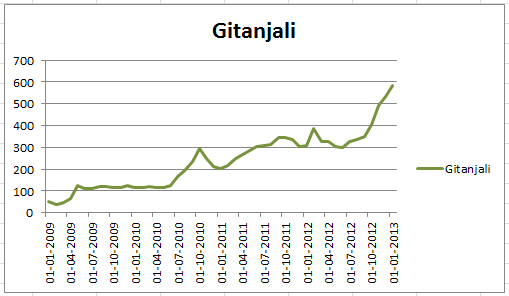 This chart is showing how Rs.1000 invested (early 2009) in gold, Titan, Gitanjali has transformed in next 4 years. Stocks in the same sector have outshined raw gold return value. In this study by this time we have missed some additional factors which are again favouring investment in stocks. 1. Buying gold as jewellery has big taxation in term of purity and making charges. It eats more than 10% in one round trip. On stocks, investors have to pay maximum 1% brokerage. 2. Stocks yield dividend time to time (both stocks has paid yearly dividend) while gold requires payment of locker charges. 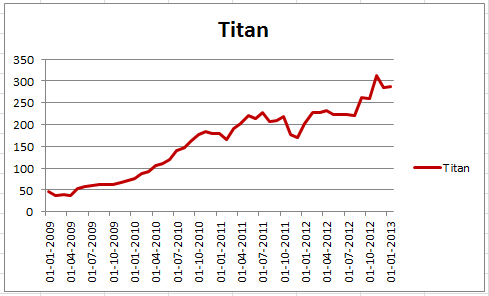 In fact Titan has paid very handsome dividend (around 15% of the stock value on the moment) twice during this sample period. In case of India, gold price appreciation credit majorly goes to devaluation of Indian Rupee. In fact this devaluation has still conserved the gold investment perception in India. Otherwise in countries like US, it has already crashed by more than 30% from peak value. 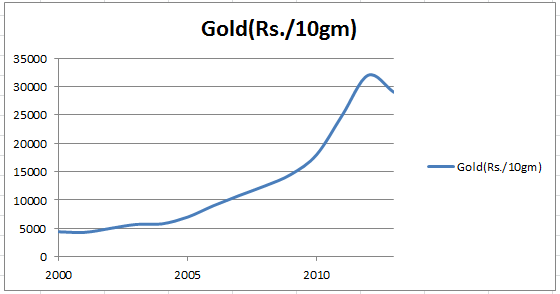 If we compare with that then in today's market (June 2013), we should get 10gm gold for Rs.20, 000. 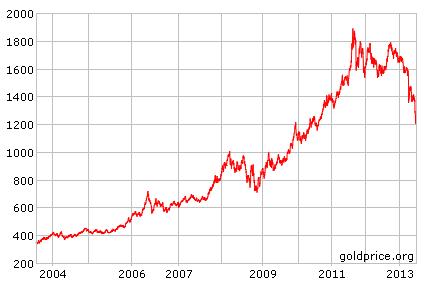 See how gold price has changed in last 10 years in US market. It is also worth to have a glimpse of gold price in last 30 years across various parts of globe in their own currency. It is worth to note that except India gold price has major fluctuation and correction in rest of the world. Hence, investment in gold for Indian investor is subject to belief in rupee valuation in future. Conclusion:: Investing in stocks related to jewellery business is better than gold jewellery. Stocks have amplified return value with less impact on buy/sell expense in comparison with buying gold jewellery. Devaluation if Indian rupee in past had major support for gold price appreciation in Indian market. If Indian economy will go up, this trend may not continue.